Adi Shankara is the adobe of all shruits, smrithis and Puranas. In fact if today Hinduism has survived for more than 200 years with a vitality that reaches the entire survived for more than 200 years with a vitality that reaches the entire humanity, it is because of great avatars himself out of compassion, love and mercy for the struggling humanity comes in their midst to show them the path of righteousness which would liberate them from ignorance and fee them from cycle of birth and deaths. Adi Shankara wrote commentaries on Brahma Sutra, Bhagvad Gita and Upnishads. The Three Treaties which from the bedrock of Hinduism. His commentaries on these three works. His commentaries constitute an intellectual treat which was difficult for ordinary lay men to follow. Further he felt that a pure monistic approach of the Adavaita Siddhanta would not be understood, practiced and followed the pre Shankara Vedic tradition of the Bhakti and Karma marga. He felt in our Vedas should be given in a simple, lucid language which can be understood by one and all. 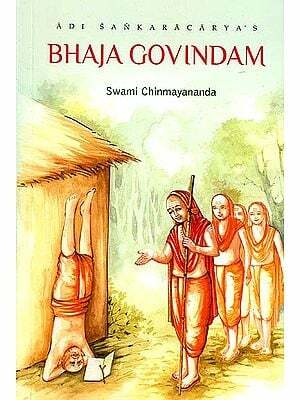 Therefore, he wrote the Bhaja Govindam. 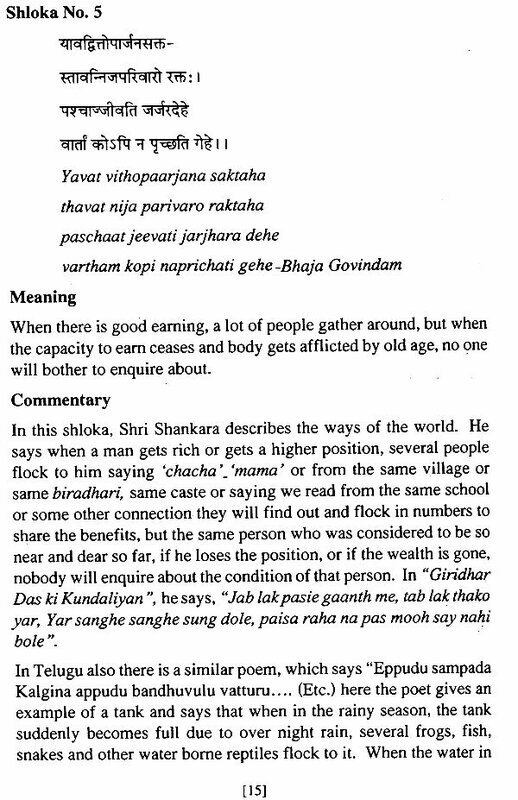 Every sloka in Bhaja Govindam has two meanings (1) the meaning conveyed by the language used and (2) the inner philosophical implications. These verses have attracted people all over the world and in many homes they are tought to children. As Kanchi Parmacharya said, the gem of Bhaja Govindam has several facets and this gem contains within it a brilliance which reveals the purpose of existence and the need to devote oneself to the sevice of Govinda. The title Bhajaa Govindam has a significiance. 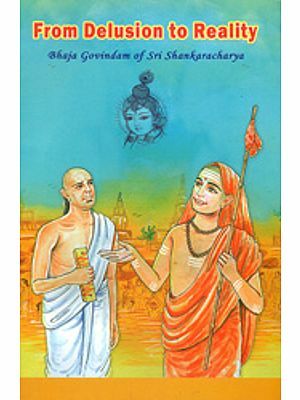 Adi Shankara’s Guru was Govinda Pada. To pay homage to Govinda Pada he uses “Bhatija Govindam”. Govinda again is a unique name or Maha Vishnu. Vishnu has 1000 names in Sahasranama, but the easiest name which people in India utter often, with ease and ananda, is Govinda. People are not unaware of the practice. That if some one in the religious congretion says “Govinda”, the entire gathering say in chorus “Govinda” “Govinda”. In a socio-religious gathering if some one will respond in the Govinda nama. It is a practice in many homes to utter the name of Govinda when serving food to athithis. The name Govinda has three meanings. The letter ‘gov’ means cow and Govinda means the protector of cows. Cow is the universal mother from Vedic days. But for cow’s milk all humanity’ would have perished. Govinda is one who protect the earth is Govinda. It encompasses the entire earth and humanity. It also means Vedas. Vedas do not belong only to Hindus alone. As Vivekananda says “ Vedas are the essence of Universal Knowledge” and Govinda is one who protects the Vedas. 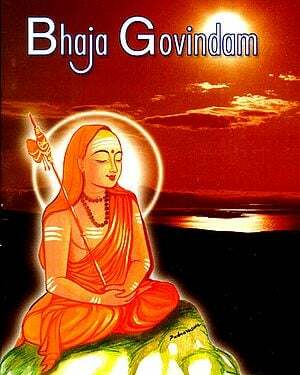 Therefore, Adi Shankara chose the expression of Bhaja Govindam. The etymological meaning of Bhaja is to serve, to sing the praise of. So to serve and sing praise of Lord Govinda, Govinda Bhajanam is necessary. 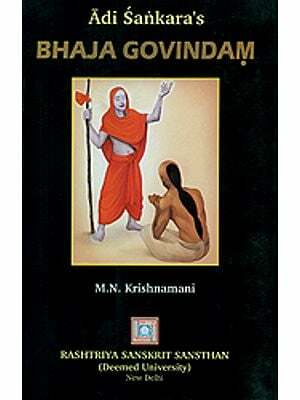 To write a commentary to explain the literal meaning as well as inner meaning of Bhaja Govindam requires a deep understanding of oue culture, scriptures and unanswering devotion to God. It is not given to many to have this combination. Shri Subbaiah who has written this commentary has combination of scholarly dedication, stead fast devotion to Bhagwan Ramana and Thorough understanding of great works of Ramayana, Srimad Bhagvatam, Upanished and Niti Shastras. A gentle humour which is characteristic of Subbaiah’s discourse, is also shining in many places. This book is not a common place commentary and translation. It is work of art by a learned scholar who has devoted his entire life in elevating the thoughts and lives of many busy men of modern age. This is priceless contribution to Ramana by Kendra by a Staunch Devotee Of Ramana. Sri K.C. Subbaiah Writer of this commentary on Adi Shankara’s Bhajagovinda storam is from a learned vaidika family in Andhra Pradesh. His father Late Sri Laxmaiahguru was a great Vedic Scholar having studies Vedas living in gurukul for over 20 years and had trained his son from his childhood. Sri Subbaiah joined the Indian Meteorological Service in 1940 and after his postings in Pune. Visakhapatnam and Madras was finally posted in Delhi in 1954 from where he retired as an officer in 1980. From his Madras Days, he was associated with Madras Kendra and after his reaching Delhi when the Delhi Kendra from its inception. He studied Vedanta from great teachers. Sri Vazuthoor Rajagopala Sarma, and has greatly benedited from his lectures as well as the lectures by Sri Anna Subramaniya Iyer of Ramakrishna Mission at Madras and Prof. K. Swaminatham Ramana Kendra Delhi. The weekly discourses at delhi Kendra by Sri Subbhaih are highly appreciated. Besides his wide learning in Vendanta. He has studied Astrology from Bhartiya Vidya Bhavan, Delhi, Vaidika Prayogas from his father and Naturopathy. Leading a simple life in Delhi, Speaking at various fora in any of the four languages, English, Hindi,Telgu and Tamil, serving the Ramana Kendra in an Hony. Capacity as Vice president he is great asset to the Kendra he is the asset to the Kendra as well as to the public even at his present age of 80 years. All devotees throng to him for spiritual guidance and he is always ready to assist them without thinking of his personal needs. We wish him all health, happiness and many more years of service by Bhagvan’s grace. Bhagvan Ramana Maharshi begins the opening verse of Sai Darshanam with the word ‘Sat’. Having realised that ‘Sat’ at a very young age of 16 years Maharshi laid great emphasis on realizing that ‘Sat’ as the sole and the only purpose of life and directed the people who went to him towards the realisations of that ‘Sat’. Bhajagovindam, astotram of Adi Shankara too laid the stress on the same goal saying ‘kuru sat budhism’ from the beginning. Our Paramacharya of kanchi used to say that the essence of Vedas is in the Upanishads, the essence of the Upanishads is in the Gita, and the essence of Gita is in the shlokas in Bhajagovindam. That is the greatness of this Bhajagovindam. 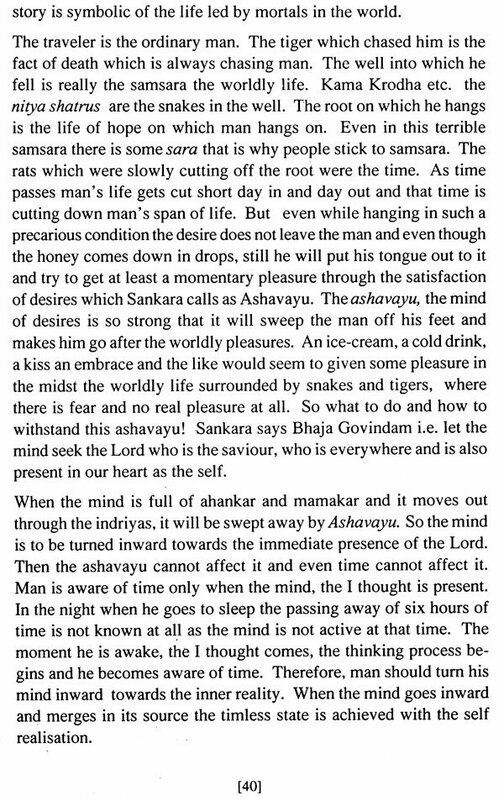 The shlokasin in Bhajagovindam though appearing to be simple, and easily memorized by school children as well as grown ups point to the need to realize that ‘Sat’ instead of being drawn away by the wordly activitiesand wordly pleasures. 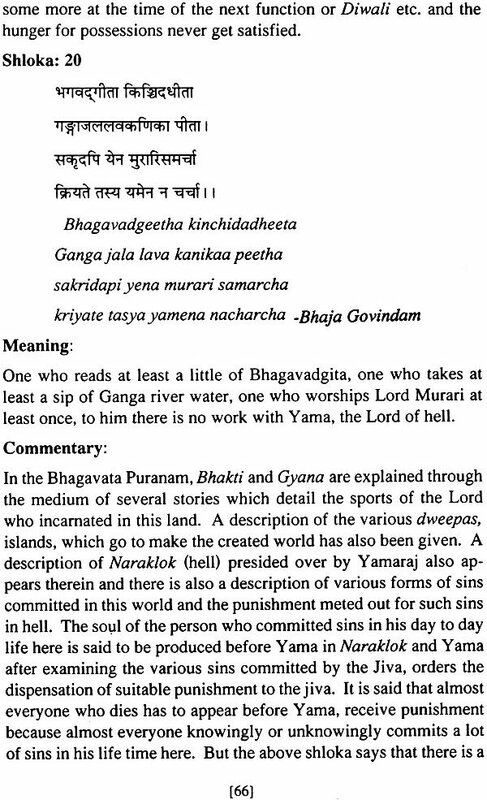 These shlokas have greatly impressed me from my childhood and attempts is made in this commentary on the Bhajagovindam Shlokas to bring the attention of the common man to the need to the attain that reality without getting bogged down by indulging in wordly enjoyments and wordly pleasures and missings the goal. The effort in this small flower offered at the divine feet of Adi Shankara and Bhagavan Ramana would worth it if read and taken seriously by at least some, and the writer appeals to every one to get benefited by going through this small piece of work. 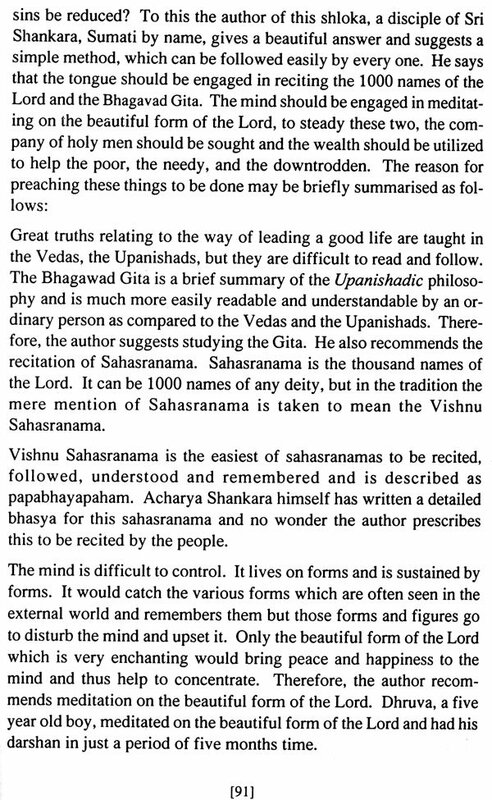 The slokas have been taken from a book available at the Ramana Kendra Library. If there is any variation in the slokas, the readers are requested to bear with me. Bringing out this publication has been possible due to the untiring efforts of my colleagues and workers of Ramana Kendra library Delhi and their love and affection. May the Kendra grow from strength to strength with the blessings of Adi Shankara and Bhagavana Ramana.